The little guy – a baby brother for the pair’s 2-year-old son Bodhi – arrived on Monday and weighed in at a healthy 8lb 4oz. Everyone is doing well, from all accounts! Teresa announced the birth in traditional style, posting a super-sweet family-of-four shot to Instagram yesterday. “Our sweet littlest love is here. Forest Sage Palmer was born yesterday in Adelaide on 12/12 at 12:18pm weighing 8lb 4oz and 20 inches long! Our hearts are so full and blessed, he is perfect!” The 30-year-old star of Hacksaw Ridge and Point Break wrote. The accompanying photo is heart-warming enough to melt the polar ice-caps, be warned! Teresa has shared a bunch of photos of her pregnancy on her Instagram account, and tracked her conception-to-birth thoughts via a super comprehensive pregnancy diary on her blog, Your Zen Mama. 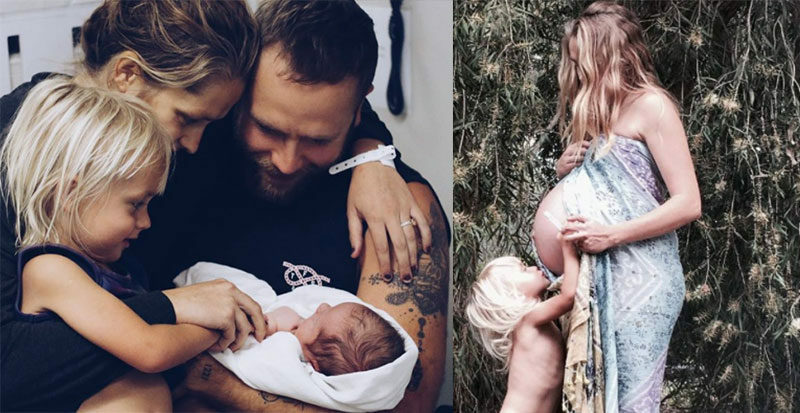 “Bodhi was so excited to do a 40 weeks photo shoot and just kept on kissing me and snuggling with baby,” the actor wrote in her most recent (pre-birth) post. She also posted a video update (from the bath tub!) sharing her thoughts on the final weeks of her second pregnancy. Palmer and actor-director husband Mark married back in 2013 after first chatting on Twitter a year earlier. “We began talking through Twitter,” Teresa told news.com.au earlier this year. And so began a very modern romance. Mark has a son from his previous relationship with actress Frankie Shaw, so as of Monday he’s a dad to three adorable boys. According to her blog, Teresa was more than ready to face the jump from blended family-of-four to cute gang of five, too. “What a beautiful journey these past 40 weeks have been,” she posted. Congratulations to the Palmer-Webbers on the arrival of little Forest! Some magic here waiting for the littlest love to join our tribe ✨ #40weekstoday What are your birthday guesses?